Hattori Hanzo: Why do you need Japanese steel? Hattori Hanzo: You must have big rats if you need Hattori Hanzo's steel. For a couple weeks in Los Angeles, a particular screening has been taking place, which has been feeding the desires of all film geeks who have attended. 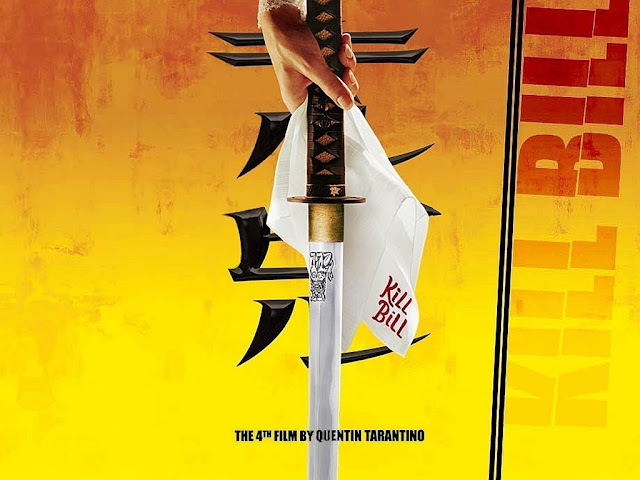 I am speaking of the original, full cut of Quentin Tarantino’s fourth feature film – Kill Bill. Billed on the marquee as Kill Bill: The Whole Bloody Affair, this is the original print of the film, which premiered at the Cannes Film Festival back in 2003 (complete with French subtitles). This is the version of the film that fans have been waiting to see released onto Blu-ray/DVD, many of whom have yet to even purchase the separate volumes of the film in its anticipation. Thanks to the New Beverly Cinema (which is now owned by Tarantino, himself) many, including myself, were able to finally see what was originally intended to be a highly stylized, epic revenge saga, starring Uma Thurman as The Bride. The result is a fully realized version of an already well appreciated slice of superior genre fun. For those not familiar with the New Beverly Cinema, it is a historic theater located in Los Angeles, CA. It now specializes in showing double features in 35mm. These double features are always connected by a theme and, with some exceptions, tend to be genre films such as 70s horror films, blacksploitation films, Hong Kong action films, etc. (basically movies that would tend to influence Tarantino). There is always a monthly flyer of scheduled programming and various directors have even made specific programming suggestions and arrangements. In addition, the films shown tend to be presented with trailers that would be modeled on what type of trailers would have been shown during the original release of the film. For this screening, audiences got to see trailers for films such as Coffy, Shogun Assassin, and They Call Her One Eye. With that out of the way, it is now time for the whole bloody affair. Vernita Green: So I suppose it's a little late for an apology, huh? The Bride: You suppose correctly. 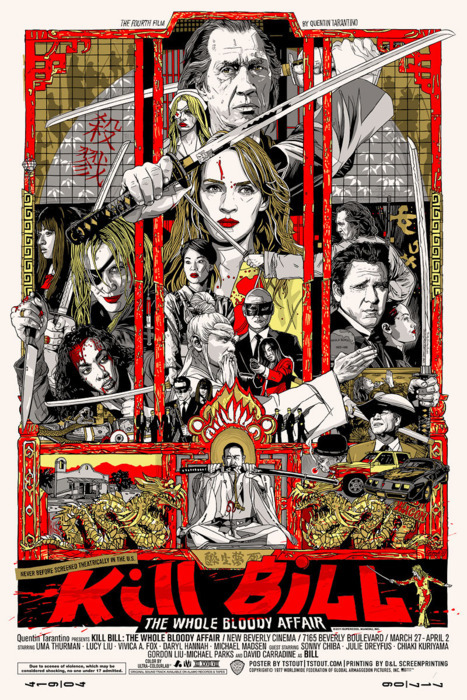 Kill Bill is an epic tale of revenge, with homage paid to many different film genres, such as martial arts flicks, spaghetti westerns, and samurai films. 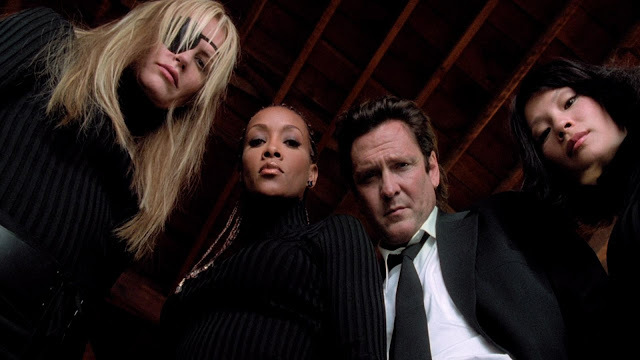 It also features all of the various Tarantino trademarks, such as the use of pop culture references and music, witty, lengthy dialogue, and a nonlinear storyline structure. The film has been divided into ten chapters and features an intermission at the halfway point. I will go more into detail about the changes from its theatrical “Vol. 1 and Vol. 2” format later, but this original version does feature a number of differences, mainly involving how the film is structured around its mid-section. The film begins with our hero, at first known only as The Bride (Uma Thurman), facing the aftermath of a massacre. 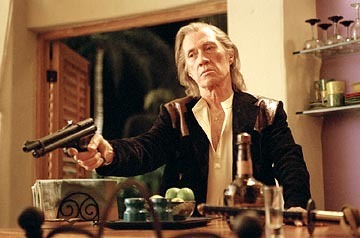 Beaten and bloodied, while pregnant, she receives cold words from her former boss/lover, Bill (the late, great David Carradine); only to receive a bullet to the head. One thing to note: The Bride was formerly the greatest female assassin in the world. Cut to four years later, The Bride awakens from a coma caused by shot to her head. She is understandably upset, not only for the injuries delivered to her, but for the loss of her child. To quell the situation with extreme adjudication, The Bride sets out on a mission of bloody revenge. Budd: That woman deserves her revenge and we deserve to die. This plan will involve facing off against the former members her team, known as the Deadly Viper Assassination Squad. This team included O-Ren Ishii (Lucy Lui), Vernita Green (Vivica A. Fox), Budd (Michael Madsen), and Elle Driver (Daryl Hannah). Led by Bill, this team was responsible for the bloody massacre that set everything in motion. 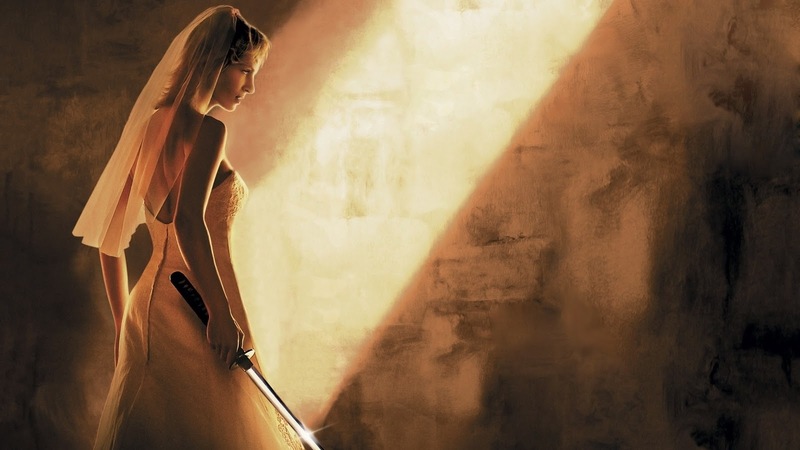 In order for The Bride to successfully face-off against her very deadly foes, she will need to gather all of her strength, recall all of her training, and get hold of all of the skills and weapons she needs to take each of them down. To successfully do this, The Bride will have to call back to her training with the powerful martial arts master, Pai Mei (Gordon Lui), as well as acquire the most powerful of swords from the greatest swordsmith of all time, Hattori Hanzo (Sonny Chiba). These efforts will serve The Bride well, but it will be up to her to truly fight with all she has, in order to get her well deserved revenge. I should note where I stand on Kill Bill, when it was initially released in separate volumes. I fully enjoyed both films for all that they had to offer. Volume 1 was a blood-soaked exercise in style, putting forth all that was necessary for a film that was modeled on 70s martial arts flicks. It is more focused on action and style than the film that follows. Volume 2 is a film that functions much more as a spaghetti western, with an extra helping of samurai film influence tossed in as well. The action is less stylized and more brutal, with a stronger focus going towards plot and dialogue. Overall, I am very fond of both films separately, but Volume 2 is the film I tended to come back to more often. The Bride: Wiggle your big toe. One thing that I always thought would be an issue when it came to wanting to see this film as one full length feature was how it would flow as a whole. I have long thought that the two volumes are different enough stylistically that it did seem very appropriate to have the films separated, regardless of the actual reason why (most likely a combination of the lengthy runtime mixed with the Weinstein’s desire to make money off of two times the ticket sales). Having now seen the entire film in its original form, I could not have been more wrong. The full cut of this film is not only wonderfully cohesive, but the preferred version for me to now watch. It truly is a shame that this version is not yet available for everyone to see. The way this film evolves in its tone over time, how the different genres clash, and how it functions overall as a film with many different styles at play is perfectly woven together to make a truly engaging epic that manages to have fun and make fun of all of the elements that it has combined into one film. Tarantino and his unfortunately, recently passed editor, Sally Menke were completely in control from the start when it came to putting this whole thing together. As far as what is different goes, it is not a matter of substantial changes and extra material, but more of a strong note to what is structurally different upon reaching the midway point of this film. Without completely spoiling anything, there is certain knowledge that is held back from the viewer by the time the film reaches the end of its first half, which was previously revealed at the end of Volume 1. The impact this revelation has by the time it is revealed in the second half of the film would have made a huge difference if the film were initially seen by those coming into the film for the first time. Along with this change, a lot of differences are actually related to the removal of scenes that were obviously shot to make the film function better as two standalone films. Finally, as this version is technically unrated, a major sequence referred to as the fight at the House of Blue Leaves is now shown in its entirety, which means it is now in full color throughout and contains a number of additional action beats that may have previously been cut due to the violence. A few more bits of violence and some minor editing differences are also apparent over the course of the film as well. 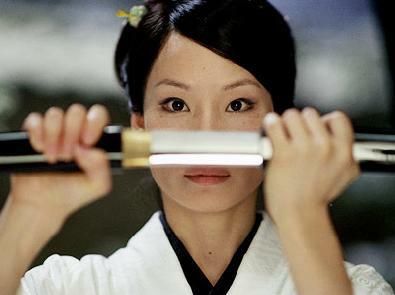 O-Ren Ishii: Silly Caucasian girl likes to play with Samurai swords. As the focus of this is more related to detailing the experience of seeing The Whole Bloody Affair, I do not feel I need to dig into the actual critique of the film as much. I have already given a strong stance as to where I stand on this film and have even written about them separately in different areas in the past, on multiple occasions. 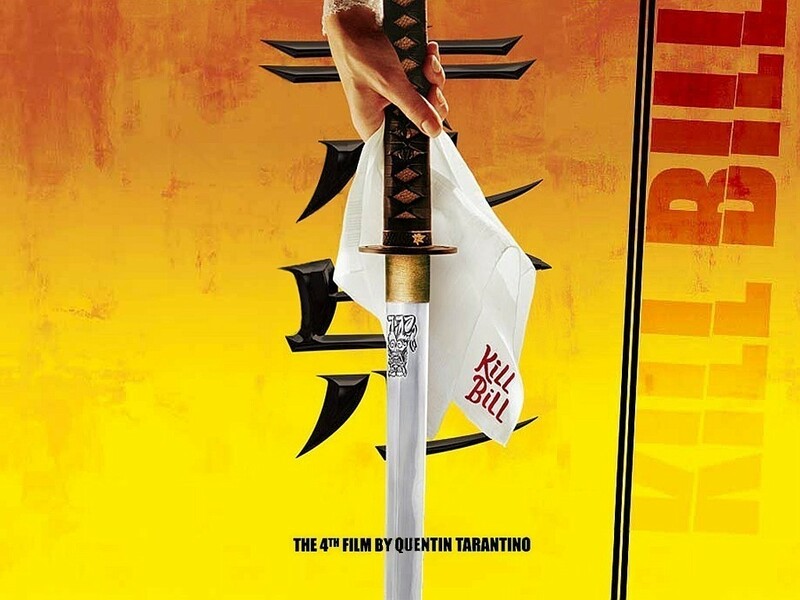 At this point, Kill Bill is now eight years old. Whether you have been a fan or not in the past, it would be hard to argue that they have not made any sort of impact. The soundtrack alone has been incredibly popular over the years, whether it be the signature track, “Battle Without Honor or Humanity,” which was played in all of the trailers or the song, “Woo Hoo” by The 5, 6, 7, 8’s, which seemed to become incredibly trendy. It is of course not logical to say that Tarantino is the mastermind behind this style of action, as he has been influenced by so many different types of films, only to take on their qualities and make them into his own, but he is a leading cause in its resurgence in popular culture. 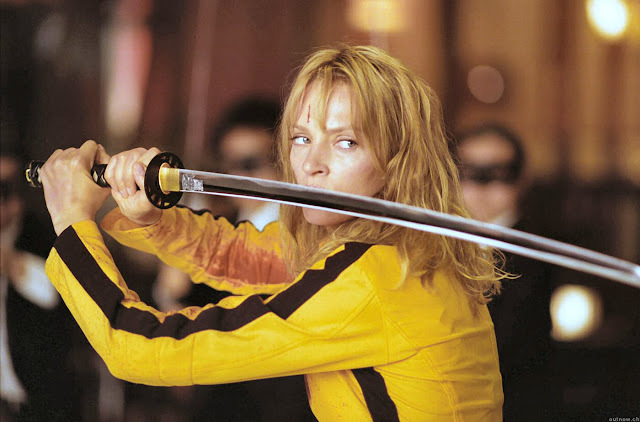 I feel it would be safe to say that the use of over-the-top, stylized filmmaking in many recent films, TV shows, and other media would not be so prevalent if it were not for Kill Bill. The Bride: You and I have unfinished business. Bill: Baby, you ain't kidding. 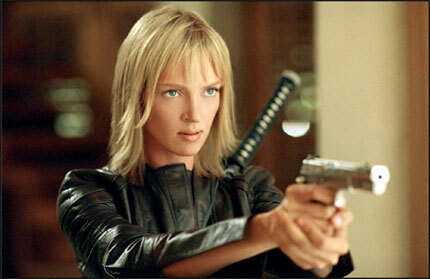 I did say I was not going to do too much more analysis on the film, but I will point out the work from Uma Thurman. Her work as The Bride was pretty fantastic. I acknowledge the help that was definitely received from her stunt double, Zoe Bell (who would go on to star in Tarantino’s Death Proof), but Thurman delivers such a great performance both physically and emotionally. Over the course of the film she is put through hell, as a character, but all of what she does, whether it be the brutal fights, the tense stand offs with the other characters, or the handling of all of the very well written dialogue (including discussions in different languages) has paid off greatly for a role that easily anchors this film. There is fine work from the other actors as well, particularly David Carradine and Michael Madsen, but without this strong Bride, there is no film. It is almost unfair to get this far and report that there is still no official plan for the full Blu-ray release of Kill Bill: The Whole Bloody Affair, yet that is what the case still remains. It has to be a tough wait to those that are still holding out (even though they’ve probably seen the films plenty of times at this point), but it will definitely pay off for them in the long run. I am not about to throw around words like “perfection,” but this original cut of the film is pretty damn spectacular, and should also remind anyone of how much fun these films were when they were first released. 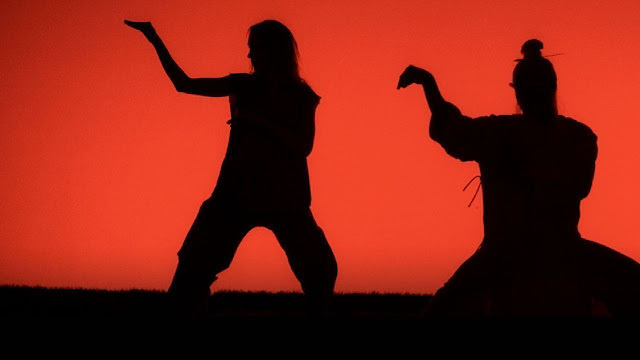 The Kill Bill saga is one that I can only hope will be coming sooner rather than later to the homes of the masses, but it is still important to know that astonishing work was at play when this film was made, and even as it stands – separately, these are still great films to watch. Hattori Hanzo: Revenge is never a straight line. It's a forest, and like a forest it's easy to lose your way... To get lost... To forget where you came in.